Master Blender Manuel "Manolo" Quesada, is the President of Fonseca Cigars., so you already know that these cigars are going to be great. Fonseca Classic cigars posses a US Connecticut Shade Grown Wrapper, a Dominican Long Leaf Binder and a Mexican Sumatra Filler. 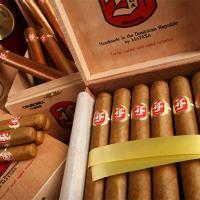 Fonseca Vintage Collection are aged a full 5 years before they are available to the public. Like the Fonseca Classic, they feature a Connecticut Shade Grown Wrapper (but from Ecuador), a Dominican Olor Binder and a Dominican Long Leaf Nicaraguan & Peruvian Ligero Filler.